Southern State's Web Accessibility Guidelines are based on the internationally accepted Web Content Accessibility Guidelines AA standards (WCAG 2.0) published by the W3C World Wide Web Consortium (W3C). SSCC is committed to providing exceptional learning opportunities to all students, including those with disabilities. Faculty are required by law to make their online course content accessible to all students. Adhering to Web Accessibility Guidelines and Best Practices while developing your online course content will benefit all students including those with visual, hearing, mobility and learning disabilities. Click the links below to expand or collapse the guideline definitions. Use properly formatted headings to structure the page. Headings help organize your content, making it easier for everyone to read. Headings are a primary way to navigate pages using screen reading software. H1 is already provided to identify the page in MyELearn. H2 headings are used to delineate major sections of a page. H3 headings are used as the title of content items or key content elements on a page. Format lists as proper lists. When typing a list, use the proper tools to make a list. Properly formatted numbered lists and bulleted lists are accessible. Select the content you want to make into a list. Then on the toolbar, click on the Unordered List icon if the order doesn't matter or select Ordered List from the drop-down menu if the order does matter. Write meaningful link text. Links embedded in text should describe the link's destination. 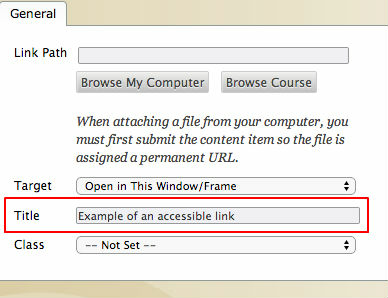 Links should also be in a logical order on the page to help users navigate by tabbing using the keyboard. If you have a link that isn't self-descriptive, or the link destination could benefit from being explained in more detail, you can add information to a link using the title attribute. Create tables with column and/or row headers, and ensure a proper reading order. Table headers are essential to understanding how the information is organized. Reading Order in a Table is Important. Screen readers read tables from left to right, top to bottom, one cell at a time (& only once). If cells are split or merged, check the reading order. Use sufficient color contrast. Don't use color alone to convey meaning. Without sufficient color contrast between font and background, people who are color blind and low vision will not benefit from the information. And using color alone to convey meaning will leave those who are color blind or blind unable to interpret the meaning. Ensure that any action that uses a mouse, can also be completed using only the keyboard. Mobility and visual disabilities often prevent people from using a mouse. If content is not keyboard accessible, it will limit many people's opportunities to learn from the content. Provide alternative (Alt) text descriptions for images. Alt text is read by a screen reader. It should adequately describe what is being displayed and why it's important. This allows screen reader users to benefit from the information being conveyed by the image, even if they cannot see it. Design clear and consistent navigation. Clear and consistent navigation in your course will allow students to focus on your content rather than on how to find it. Eliminate or limit blinking / flashing content to 3 seconds. Blinking content is not only distracting it can cause seizures in persons with a photosensitive disorder. Label form fields and buttons clearly, and ensure a proper reading order in a form. Reading order of a form is important. Using the tab key, your cursor should follow through the form in the same order it is intended to be completed. Labeling buttons and form fields is important. A screen reader will identify the field by reading the label. It should adequately describe what should be filled in. Provide a transcript for audio that you or SSCC produced, if it will be used for more than one term. Audio transcripts benefit everyone. They are essential for the deaf and hard of hearing and they assist non-native English speakers who can read along while listening. Require only accessible software & applications. Inaccessible software and applications will shut students with disabilities out. Ask the software developer for a VPAT (Voluntary Product Accessibility Template) to help determine the product's accessibility. Write math and science equations accessibly. Use an accessible equation editor to write scientific notations, equations and formulas. This will allow screen readers to read equations properly.